As you search for the right pressure washer, there are many factors you will have to consider and compare. If you are like many buyers you will be comparing the pros and cons of gas versus electric pressure washers. You can contact Hydro Tek for a personal analysis if your needs and the best power washer to meet them. In the meantime, keep reading for a direct comparison between gas and electric power washers. As the name implies, a gas pressure washer runs on gas. They are the original option and people who have worked with many pressure washers over the years often want to stick with what they know and what they know is gas pressure washers. One of the biggest advantages of a gas pressure washer is that it is very mobile. Unlike an electric power washer that must be plugged in – and therefore within range of an electric outlet – gas pressure washers do not require an external energy source. While that is an advantage in some situations, it can actually be a disadvantage in others. How? Because gas units cannot be used in enclosed areas. For example, if a person wanted to use a power washer to clean a basement, they would not be able to use a gas power washer because the fumes can be dangerous. Electric pressure washers are less popular than gas pressure washers but that should not be reason in and of itself to choose gas. Why? Because electric pressure washers are relatively new to the scene. As a result, it stands to reason that their gas counterparts would be doing better. 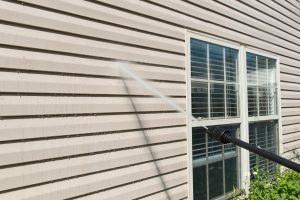 As noted above, one of the advantages of a gas pressure washer is that it can be used indoors or in any enclosed space without fear of danger from fumes. It is also generally more affordable than a gas pressure washer, which makes it a great choice for an individual. Finally, electric pressure washers are noticeably quieter than their gas counterpart, which can be a big bonus for some people. That said, the affordability is there for a reason – there are downsides. First, gas power washers do not have the same amount of power as a gas option. For this reason, professional pressure washers are almost always gas, unless they are being indoors and electric is a must. Second, electric pressure washers are not as common and do not have as many accessories. Which pressure washer is best for you? That depends on what you will be using it for, where you will be using it, your budget, and your priorities. If the guide above still hasn’t convinced you of which one to buy, contact Hydro Tek at 800-274-9376 and we can help.